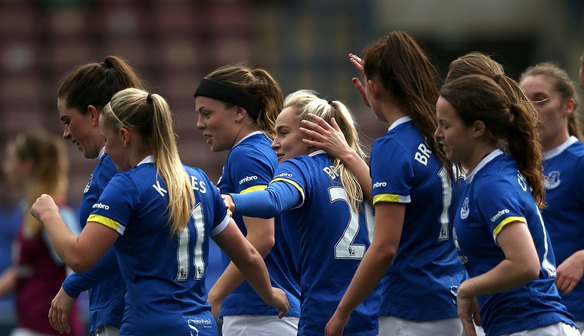 Everton stand on the cusp of lifting the FA Women’s Super League 2 Spring Series title after a four-goal demolition of Watford at Goodison Park. Strikes from Georgie Brougham, Aileen Whelan, Olivia Chance and Simone Magill were enough to see off the Hornets and leave the Blues needing only a draw in their final game with London Bees on Saturday, May 20, to secure the title. Everton dominated the opening exchanges, with Brougham going closest when she saw a header turned wide from Danielle Turner’s corner. Next came Brougham’s looping header, which put the Blues ahead after some neat interplay from another Turner corner on the right. But the Hornets almost replied instantly when midfielder Danielle Puddefoot’s glancing header was turned round the left-hand post by Everton stopper Kirstie Levell. As the visitors tried to force their way back into the contest, the Blues went close to extending their lead when defender Gabby George broke clear in the box but just failed to find a teammate. Whelan put the hosts further ahead just after the interval, with a spectacular effort from the left side of the box leaving Everton in control. Substitute Chance killed off the Hornets’ fading hopes when she saw her left-footed effort from the right side of box deceive stopper Josephine Fletcher. And as the seconds ticked down, Magill turned what was a comfortable victory into a rout with the Blues’ fourth. “At the end of the day, we pushed through it and scored some goals and we won, so we’ll take that and learn from the stuff that wasn’t so great, and move on to our last game next week. “In the first half, we were not playing as well as we have done. “We just didn’t keep possession enough and even in parts of the second half, we just didn’t manage the game as well as we usually do. “I find it always hard coming onto a game that’s already been going for 60 or so minutes. “I try to get into either a good pass or a hard tackle and that will build my confidence as I go on. “I get a little bit riskier as the game goes on — have the shot, give it a go. “It was nice to score in this stadium. It’s my first time being in it, but it all goes down to the team. “Playing at Goodison is a great experience and obviously, it wasn’t the experience that we wanted here — conceding four. “Personally, I don’t think it was a 4-0 game. We had a few chances ourselves and on another day, they may have gone in. “We knew they had a few players and they’ve obviously got quality across the squad, but on our day, and with the performances we’ve been putting in lately, I think we could easily have matched them. “But we were clearly not up to scratch and I think maybe playing at this stadium has affected some of us, and we weren’t ready for the big stage. “At 1-0, I hit the post in the first-half and that could be a different game — that could go 1-1. “We were coming in at half-time at 1-0, and the head was down. Brougham 18, Whelan 48, Chance 81, Magill 90. Substitutes: Aileen Whelan for Claudia Walker 45, Olivia Chance for Mollie Green 67. Watford (4-1-2-3): Josephine Fletcher; Tyra Poole, Anneka Nuttall, Victoria Neal, Charlotte Kerr; Merrick Will, Danielle Puddefoot, Lilli Maple; Adekite Fatuga-Dada, Cherrelle Albert, Rinsola Babajide. Substitutes: Lauren Jordinson for Merrick Will 55, Leah Cudone for Cherrelle Albert 55, Simona Petkova for Lilli Maple 64.